The Real 'Exalted Queen Mother' of RHS? 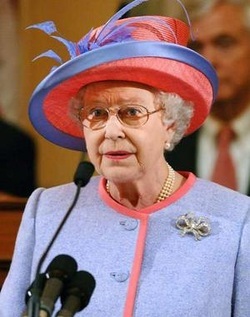 When Queen Elizabeth II was on the news yesterday, shown visiting Jamestown in Virginia, she was wearing what was an obvious "Red Hat Society" outfit with a lavender dress and red hat w/purple trim. and Masonic connections, but I have also uncovered some things about the Red Hat Society that, though seemingly mundane* and harmless (to some) from the outside - is at the very least, unscriptural and even rebellious to the Word of God. *MUNDANE: 1. Of, relating to, or typical of this world; secular. WORLDLY 2. Relating to, characteristic of, or concerned with commonplaces; ordinary. The 'Red-Hatters' do seem very harmless and commonplace for the most part, and most probably are. But what lies at the origin of the group is the real concern. Queen Elizabeth's possible connection to, and endorsement of, the RHS has only deepened my concerns. As for the foundation and premise of the Red Hat Society being unscriptural, compare the poem below, "Warning...," to the command given to 'older women' in Titus 2:3-5. I have also researched some information and pictures regarding the use of purple robes (and red hats) in the practice of witchcraft. For instance, the witch who 'consecrated' the New Age / Masonic Georgia Guide Stones is said to have donned a purple robe especially for this ceremony. And a Lesbian 'Amazon Red Hat' chapter, both in Illinois. Those came up on another google search, too." "This is the age of the Goddess, baby!’ Fair enough, and it’s only right we do bring the Goddess back into society and all aspects of the Sacred Feminine." Why 'All Hail' to the RHS from a Wiccan Society? 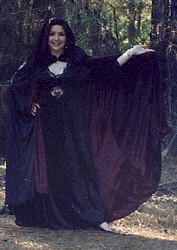 Does it represent the Crone in pagan Wiccan belief? 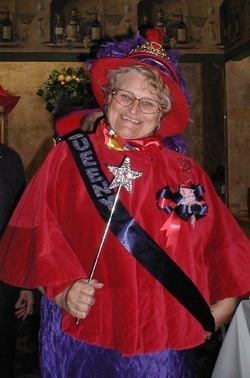 The Red Hat Society may therefore be part of a larger movement to, "Bring the Goddess back into society and all aspects of the Sacred Feminine," as stated above. 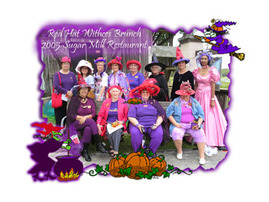 Members of the Red Hat Society are known for their outlandish red hats and purple dresses. At Halloween the ladies use the same color scheme-- but achieve a very different look. The ladies dressed in red and purple costumes for their Halloween Party in Knoxville. Many women dressed as witches with tall purple hats. 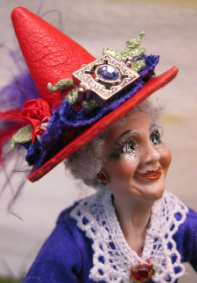 The Red Hat Society is for women over 50, who just want to have fun. 1 Samuel 15:23 "For rebellion is as the sin of witchcraft, and stubbornness is as iniquity and idolatry. Because thou hast rejected the word of the Lord, he hath also rejected thee..."
Titus 2:3-5 "The aged women likewise, that they be in behaviour as becometh holiness, not false accusers, not given to much wine, teachers of good things; That they may teach the young women to be sober, to love their husbands, to love their children,To be discreet, chaste, keepers at home, good, obedient to their own husbands, that the word of God be not blasphemed." Titus 2:3-5; 1 Tim. 5:9-15; 1 Cor. 2:10; Isa. 3:12; Prov. 31:10-31. Many of the older women of today are NOT behaving in a Biblical manner, rather just the opposite of what scripture commands. This is also true of the younger generation as well. They do NOT honor the elderly as the Bible says for them to do. Everything in our society has been turned 'upside-down'. Read the official RHS Poem below and compare it to the mandate in Titus 2:3-5. There is only one passage in the Word of God that speaks personally to older women. It is a specific command that is given to them through the unction of the Holy Spirit. It is surprising to me that so few older women in the church bother to take any notice of these words. They live and act as though they are not mentioned in the Bible. What is this command found in Titus 2:3-5? 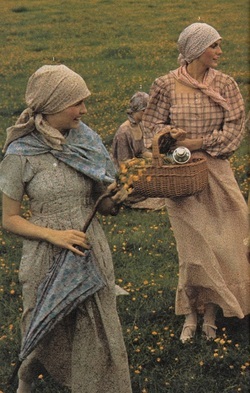 The Jerusalem Bible translations says, "The older women…they are to be teachers of the right behaviour and show (notice these words… "and show") the younger women HOW they should love their husbands and love their children, HOW they are to be sensible and chaste and HOW to work in their homes and be gentle and do as their husbands tell them…"
Not only are the older women to teach the younger women, but they are to show them by example HOW to be husband-lovers, children-lovers, and home-lovers. The Message Bible* says, "By LOOKING AT THEM, the younger women will know how to love their husbands and children…"
The fact that you are blaspheming the word of God by such conduct should give anyone reason enough for great concern! and satin sandles, and say we've no money for butter.